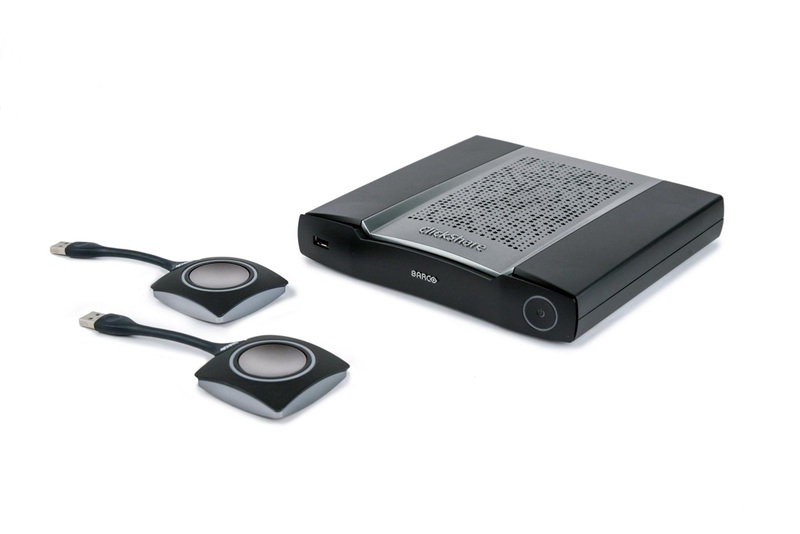 Introducing the Barco ClickShare CSE-200+ (shipping now!). The CSE-200+ was designed for enterprise rollouts. It offers a HDMI input for legacy equipment, enhanced security features, full network integration, a wide range of interactivity features - including annotation, blackboarding and touch back support on a 4K canvas and central management. Allowing up to 2 persons to share content simultaneously, the CSE-200+ encourages brainstorming and productivity in your enterprise. 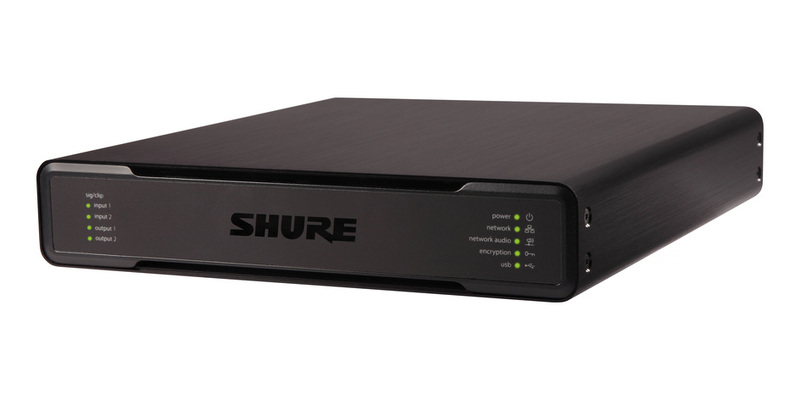 The Shure P300 IntelliMix® Audio Conferencing Processor offers IntelliMix DSP algorithms optimized for audio / video conferencing applications, featuring 8 channels of acoustic echo cancellation, noise reduction and automatic gain control to ensure a high-quality audio experience. All of the new QSC Premium Business Music Solutions products are NOW SHIPPING! The MP-M Series music and paging mixers offer unprecedented capabilities for processing and routing high-quality foreground/background audio for multi-zone retail and hospitality applications. They also provide live mixing functionality for business applications that also require live speech reinforcement, including fitness clubs, hotel meeting rooms, banquet halls, etc. Built on the same platform as the award-winning QSC TouchMix Series, the MP-M Series includes the MP-M40, which offers four mic/line inputs, four inputs and four zone outputs, and the MP-M80, which offers eight mic/line inputs, eight phono line inputs and eight zone outputs. Housed in a compact 1RU chassis, each includes a wealth of DSP resources, priority ducking, scheduling and automatic mixing functionalities. It also maximizes the value of a QSC system by including Intrinsic Correction loudspeaker tuning for QSC loudspeakers (as well as providing integrators with the ability to create their own loudspeaker tunings). Systems designers and installers will use the MP Install app (for iOS/Android tablets, Windows and Mac OS PCs) to quickly design and configure systems for MP-M Series mixers. This wireless control features an intuitive Workflow Wizard to assist installers with navigating the room tuning process and expediting commissioning tasks. The portfolio also includes wired MP-MFC wall controllers, which provides multi-zone source selection, scene selection and volume control for the end user. Installers can connect up to eight MP-MFC controllers to a single MP-M Series mixer using standard CAT-5 cabling with a maximum total cable length of 840 ft. (250 m). They can be installed in North American or European electrical boxes and are available in both black and white. For wireless end user control, the MP Manage app (for iOS/Android tablets and smartphones) provides day-to-day operation of basic system functions including zone level control and source selection, scene recall, scheduling, and mixer control. It also offers a unique store-and-forward zone paging functionality to the MP-M Series mixer. Built on the QSC legacy of dependable and quality amplifiers, the MP-A Series Zone amplifiers are music and paging amplifiers that offer an incredible amount of flexibility while maintaining Class-D efficiency and low cost of ownership. With each model housed in 1RU chassis, this series includes the MP-A20V (200W x 2 channels), the MP-A40V (200W x 4 channels), and the MP-A80V (200W x 8 channels). MP-A Series features FlexAmp Technology, which provides each pair of channels with a combined power of up to 400 W, which can deliver one channel with the full power or can be shared between the pair in any ratio. Each channel can be configured as either low impedance, 70V or 100V, with or without a high-pass filter. The new loudspeaker offering includes the AcousticDesign™ Series SUB/SAT Loudspeakers, which offers unprecedented acoustic performance from a small form factor to enhance the look of any installation. This series includes surface mount (AD-S SUB and AD-SSAT), ceiling mount (AD-C SUB and AD-C SAT) and pendant mount (AD-P SUB and AD-P SAT) subwoofer/satellite enclosures. Like other models in the AcousticDesign Series, the SUB/SAT line includes the same balanced sonic characteristics and shares high-end aesthetic qualities, which allows users to mix-&-match enclosure types. They also include easy-to-install features to minimize installation and commissioning labor costs including built-in high pass satellite outputs, snap-fit magnetic grills (for ceiling-mount and pendant-mount loudspeakers), and an easy, repeatable wall-mounting system (for surface-mount models). For installations with higher channel counts, more complex processing or user control requirements, designers can elevate the system even further with the Q-SYS Platform. This allows end users to take advantage of Q-SYS touch screen controllers, best-in-class processing and third-party device control of video switchers or environmental controls.